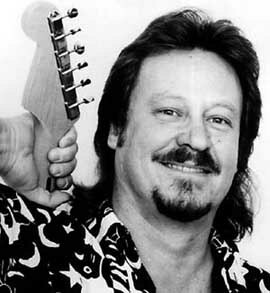 GUITARIST MAL EASTICK has played lead guitar on more instantly recognisable radio hits than you would be aware of. Most people would know Eastick's session lead guitar work on NO SECOND PRIZE by JIMMY BARNES and OUT THAT DOOR by the HOODOO GURUS But if you were asked to name one Mal Eastick tune you might have some difficulty. That's because he only released his own debut album four years ago, after 20 years in the business. Playing at the Northern Star Hotel this Friday night, Eastick knows that playing the blues is an uphill battle in terms of achieving fame and fortune. The show will be the first gig back in Newcastle for Eastick after performing at and organising last year's JIMI HENDRIX TRIBUTE before 1100 people at the Newcastle Workers Club. Eastick is looking forward to showcasing his own band in the more intimate surrounds of the Northern Star Hotel. Despite the niche market for blues music the performer's 1995 debut album THE SOUTHERN LINE still continues to be a strong performer. 'It's been a really successful album for me considering the difficulty that all blues-based bands face in Australia,' he said. 'We don't really get that much radio support, but The Southern Line album has sold over 3500 copies now and continues to sell all the time at gigs. Tomorrow afternoon at the ABC television studios in Sydney Eastick and his live band will record a live segment for the STUDIO 22 live music show, which screens on Thursday nights. After 25 years in the music business it will be Eastick's first television performance with his own band. 'It will be our first opportunity to have a video of the band, and perhaps to send a copy to people in the States to have a feel of what we're like,' he said. The band has signed a deal with FULL MOON RECORDS to sell the album in the United States and Europe via the Internet. Playing in the United States has always been a goal of Eastick's. 'I feel that the sort of music that we play perhaps has a bigger market there than it does here and it's just something we've got to check out, and have got to give it a go,' he said.